During my post-Christmas vacation, I decided to explore a spot I had never seen. In an earlier post, we saw a bit of Fir Island. This is the Skagit River delta and it is shaped like a triangle. Two sides are bordered by the north and south forks of the Skagit. The third side is a vast area of marshes and sloughs bordering Skagit Bay. Wiley Slough is a small section of these marshes. I was stunned by what I found here. The amazing size and beauty of these wetlands took me by surprise. The weather continues seasonally rainy and overcast, so once a gain, I have dredged up a photo from the past. Here, the sun is rising over Kiket Island in Skagit Bay. I borrowed the title from the Native American cultural center in Seattle, so I want to pay my respects to them. There is more information at the Daybreak Star website. On New Year's Eve, when others are getting out their party clothes, I was trekking the woods at Deception Pass State Park. I'm weird, I know, but it's my bliss. The North Beach Trail is an easy mile hike along the cliff side between the West Beach parking lot and the bridge. I was seen off by a "squabble" of gulls resting just off shore. The sun was shining brightly, but once you pass the Amphitheater and a small beach, you are in deep, mid-winter shade for the entire journey. This made taking photos a challenge. The sun had no effect on the sub-freezing temperatures either. This is a forest of Douglas Fir and Western Hemlock. A few Red Alders clung to the more open cliff side. There was a wonderful green, earthy smell. Well, it's another sunrise over Skagit Bay. Ho-hum. On the left is Kiket Island and hidden in the fog bank is Skagit Island. This one is from January, 2010. Until Wednesday, 2011 has been cloudless. Now we're getting a succession of rain and windstorms, and a heavy overcast. I have been writing here about the various creatures encountered while living on South Fidalgo Island. There are some that have eluded me. When I moved here, I eagerly anticipated the sighting of whales swimming in the bay in front of my house. For local amateur naturalists, they represent the holy grail of wildlife sightings. 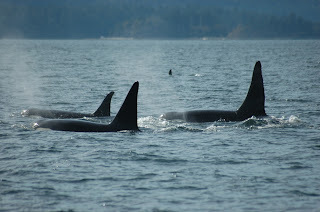 There are three families of Orcas (Orcinus orca), J, K and L pods, that cruise upper Puget Sound and the Straits. These are the "Southern Resident Orcas" of the San Juan Islands. They are known to venture into the lower Sound at least as far south as Bremerton. According to text books and TV news cameras, Gray Whales (Eschrichtius robustus) also spend time in Puget Sound. This includes Skagit Bay where I live. Even the less common Minke Whales (Balaenoptera acutorostrata) visit our waters. But not for me. Fir Island is the Skagit River delta where the river flows into Skagit Bay south of La Conner, Washington. From October to April, this is the place to see the migratory Snow Geese. The Skagit divides into North and South Forks defining two sides of the triangle-shaped island. The third side is a complex network of salt marshes, sloughs and wetlands bordering Skagit Bay. As it happens, Fir Island Road is also part of my daily commute to work. It provides a shortcut to Interstate 5. The Skagit emerges from the Cascade Mountains into a broad, flat alluvial plain. Over eons, the river meandered through this valley on its way to Puget Sound. After European settlement, the river was diked into fixed channels to control seasonal flooding and protect some of the most valuable farmland in the region. There is also an abundance of wildlife here.